Long-term data series of cetacean presence in the Belgian Part of the North Sea (BPNS) are essential to understand their habitat use and conservation needs. 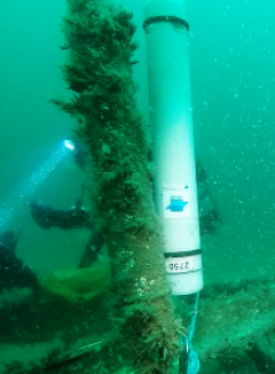 The prospects and predicaments of the cetacean passive acoustic sensor network of the Belgian LifeWatch observatory were therefore investigated by a multidisciplinary expert group in a data analysis workshop. On October 5-6, 2017, 14 experts met at the Flanders Marine Institute (VLIZ) in Ostend to explore and analyze the C-POD data generated by the Belgian LifeWatch Cetacean passive acoustic sensor network. This workshop delved into C-POD data access, exploration and analysis, as well as the design of the sensor network and future opportunities. As part of the Belgian LifeWatch observatory, the cetacean passive acoustic sensor network aims to provide a continuous, long-term data series of cetaceans roaming the BPNS. The goal of this workshop was to optimize the analysis approach of porpoise acoustic data and to evaluate the current sensor network of the Belgian LifeWatch Observatory. In order to grasp cetacean ecology and conservation needs in the BPNS, we need to know where these charismatic top-predators roam and how their distribution patterns change over time. Harbour porpoise (Phocoena phocoena) is considered to be the most common cetacean in the BPNS. Different techniques allow to detect the presence this marine introvert, each with their specific advantages and complications. Passive acoustic monitoring provides a non-intrusive method to observe this species, as well as its echolocating taxonomic family members, in the wild. With this technique in hand, we gain fundamental knowledge on porpoise distribution, necessary for an informed management of the species and its environment. Echolocation clicks of toothed whales (Odontoceti) can be recorded by a C-POD. 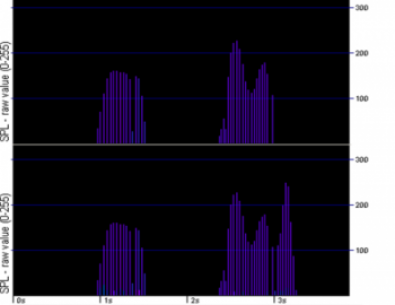 Porpoises produce Narrow Band High Frequency (NBHF) clicks around 132 kHz, which can be distinguished quite easily from the shorter and louder Broad Band Transient (BBT) clicks of dolphins. A series of clicks, a click train, is then classified by the C-POD software as originating from a porpoise, dolphin or sonar. Not only do these click trains reveal presence, but their features can also differentiate different behaviours of cetaceans. The permanent network of C-PODs of the Belgian LifeWatch observatory thus facilitates the assessment of porpoise presence in the BPNS over time. The potential and shortcomings of the C-POD data were investigated. Following a data exploration protocol (Zuur, 2010), the data were organized and explored before having a look at spatial and temporal patterns. Next, the workshop participants dedicated their expertise to analyse porpoise distribution patterns along an east-west gradient and in time, both circadian and seasonal. An approach to deal with gaps in the data was also elaborated. As the LifeWatch C-POD network will be present for a number of years, optimization of the sensor network is possible and was therefore a main point of focus. Different topics were examined and discussed, supported by relevant data analysis: the optimal mooring type, how to deal with background noise in the data, favourable recording settings, a choice of quality standard, power of the current network through sensor network analysis and complementarity with aerial survey data. The Belgian LifeWatch cetacean passive acoustic sensor network facilitates a long-term monitoring of porpoises and dolphins in the BPNS (see map on the right). This network currently consists of 8 C-PODs (Chelonia Limited) in the BPNS. The C-POD hydrophone records porpoise and dolphin echolocation click trains, that are given a species classification and quality stamp by the C-POD software. The C-PODs in the BPNS are attached to surface buoys or bottom moorings and are changed every 3 months. Since 2015, this sensor network provides a nearly continuous monitoring of harbour porpoise. The porpoise detection data of the C-POD network in the BPNS can be accessed and explored with the LifeWatch data explorer. This RShiny application enables a basic exploration with tables and plots of (a selection of) the LifeWatch C-POD data. The selected data can then be downloaded, given that the user has registered. The data exploration and download was demonstrated during the workshop. Another online web application developed in the framework of LifeWatch consists of the European Passive Acoustic Network (EPAN) data portal. Researchers can use EPAN to store, access and share their passive acoustic data and metadata. Advanced data analysis of sensor data is also facilitated by the collaborative platform on the LifeWatch Rstudio server. This platform allows cooperation on script development and analysis in a performant environment with immediate access to the sensor data. Collaboration and communication for analysis approaches with an even broader audience is made possible by the LifeWatch Github. All data, R scripts and R markdown documents used in this workshop were made available in Github through the LifeWatch GitHub page. Try out some C-POD data exploration for yourself with the tutorials on Data preparation and exploration, Mapping and Time series. More LifeWatch tutorials are available in the Marine Virtual Research Environment (Marine VRE). Two workshop participants took the data even further in their Master’s dissertations! Benefiting from the workshop’s insights, they investigated porpoise distribution in collaboration with OD Nature and VLIZ. One student worked on the seasonal presence and distribution of harbour porpoise in the BPNS, while the other project focused on porpoise density estimates from both aerial surveys and Passive Acoustic Monitoring. Augustijns, T. (2018). 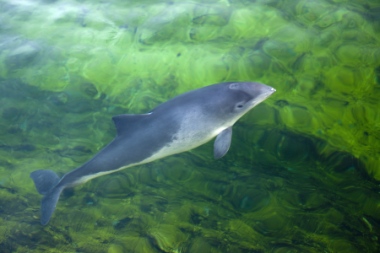 Harbour porpoises in the Belgian Part of the North Sea: Using passive acoustic monitoring to determine spatio-temporal patterns in distribution and feeding behaviour. MSc Thesis. Faculty of Sciences, Biology Department, Research Group Marine Biology: Gent. 47 pp. To learn more about LifeWatch Belgium, feel free to contact info@lifewatch.be. The Flanders Marine Institute (VLIZ) coordinates the marine components of the Belgian LifeWatch project. In this framework, VLIZ regularly organizes LifeWatch workshops and events to bring together developers, users and experts. 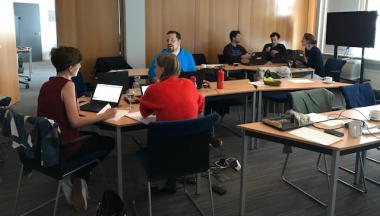 Participants of the data analysis workshop for the cetacean passive acoustic sensor network included researchers from the Operational Directorate Natural Environment (OD Natuur), the Marine Biology research group of Ghent University (Marbiol) and VLIZ. OD Natuur are now also using the EPAN data portal to store their data. Flanders Marine Institute (VLIZ), Belgium (2015): LifeWatch observatory data: passive acoustic network (CPOD) for Cetacean detection. Cetacean passive acoustic network: Learn about the hydrophone network of the LifeWatch Observatory. EPAN: Access, store and share passive acoustic data on the European Passive Acoustic Network data platform. Data explorer: Access and explore the cetacean detection data with the LifeWatch data explorer. LifeWatch GitHub: Find the scripts and C-POD data that were used during the LifeWatch Data Analysis Workshop. Marine VRE: Use the developed web services of the LifeWatch Marine Virtual Research Environment. LifeWatch workshops and events: Past and future events organized by LifeWatch Belgium.